From the flatlands of Pomona to the schoolyard basketball courts of Chicago, Steve James has trained his camera on the lives of Illinois families whose struggles and triumphs are a window into the American experience. He is the director of Prefontaine (1997), Stevie (2002) and Reel Paradise (2005), and has remained a producer for nearly 20 years at Kartemquin Educational Films, a locus for documentary filmmakers founded in 1966 by three students from the University of Chicago (Stanley Karter, Jerry Temaner and Gordon Quinn). Here James reflects on Hoop Dreams, a "longitudinal" film that examines five years in the life of William Gates and Arthur Agee, two Chicago high school students who dream of reaching the NBA. Stop Smiling: You've made several longitudinal films. At what point in a project are you certain that the story is substantial enough to warrant years of filming? 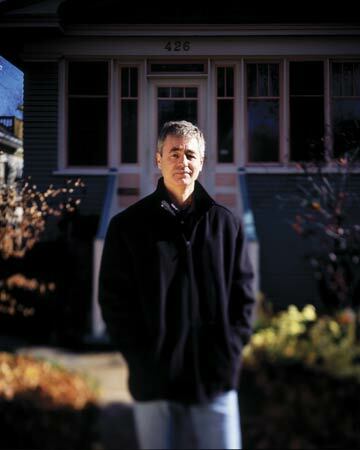 Steve James: Hoop Dreams was the first project that grew into one of these longitudinal documentaries. It happened organically. We knew once we met Arthur Agee and William Gates, and heard the coach [Gene Pingatore of St. Joseph High School] make a promise to Arthur, as you see in the film, that if he did well at basketball and the books, in four years he'd help him go to college. It seemed like such an incredible thing to say. Even then, early on with no money, we thought it would be interesting if it were possible to document this entire high school experience. Because of financing, this was a pipe dream. Maybe a year later, we felt like we just had to find a way to do it. We began filming Stevie in 1995, a year after the release of Hoop Dreams. It took until the end of 2002 to finish Stevie, and I worked on several other projects at the same time. Hoop Dreams was a labor of love for all of us involved. Everyone wanted to see the demo for Stevie because of Hoop Dreams, but then they never called back. It was Kartemquin again sustaining the lifeblood of the project for many years. We joke that the reason these films took so long to make was because it took us so long to fund them. Hell, we might as well keep filming. SS: Both Stevie and Hoop Dreams begin with stories of individuals who are ushered through various institutions across the state. What has that taught you about Illinois? SJ: The stories that have always attracted me most are personal and individual, like the kids in Hoop Dreams and with Stevie Fielding, who are characters who have something larger to say about the world we live in. I don't really start out with any incredibly strong preconceived notion about where the stories are going to lead us. I think it's incumbent upon us as filmmakers to view these projects as acts of discovery, as a trip that we take into the lives of these people. By telling them over a period of years, we see what these stories and lives have to say to us, and be open to what they have to say. Hoop Dreams and Stevie are films that have something to say about America more than Illinois specifically. The dreams of African-American families who live in inner-city environments — their hopes and dreams to have a better life — is the heart of the subject of Hoop Dreams. Basketball is the avenue these kids have chosen and the one their families support, but it's really a desire to have a better way of life that's at the root. The basketball dream became a stand-in for the American dream. SS: When you're making films, how do you handle the temptation to intervene? SJ: On Hoop Dreams, as opposed to Stevie, the filmmakers are not present in the movie. We made every effort in the editing of the film to remove ourselves from the story. You may occasionally hear me ask a question, but that's about the extent of it. That doesn't mean we didn't have relationships with our subjects or have feelings and opinions about what they were going through. We would share some of that with them, off-camera. We tried to be careful about giving advice in the same way that anybody from our background giving advice to them should be careful. Whether you're making a film or not, it's easy to think you know best and to not be respectful about where they're coming from compared to you. The issue of filmmaker intervention and filmmaker relationships with subjects is an issue that is impossible to resolve completely. Some filmmakers don't even show the subjects the film until it's done. That's not something that we at Kartemquin could ever do. We're not journalists in that way. Our goal isn't to be a fly on the wall, objectively observing someone's life, and then, in a dispassionate way, presenting it in a film. Our duty is to tell the truth as best we can, but also to do it in such a way that audiences understand these people, not sit in judgment of them.